Winnipeg – based Métis multidisciplinary artist Jaime Black will be an artist in residency at the University of Toronto, hosted by the Women & Gender Studies Institute (WGSI). Jaime addresses the complexities of history, gender, place, identity, and resistance under settler colonialism through the artistic mediums of photography, sculpture, print, and installation. 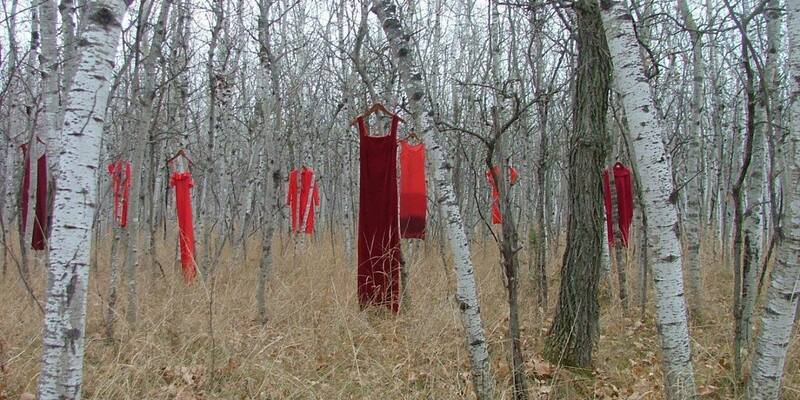 Her 2010 installation piece, The REDress Project, can be described as an aesthetic response to the 12,000+ missing and murdered Indigenous women and girls across Turtle Island. 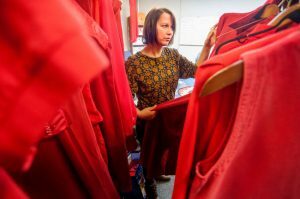 The installation comprises the public display of hundreds of red dresses, to create ‘encounters’ with the disappeared and to mark their absence, sparking visceral reactions to their loss. The work aims to create space for public discussion and dialogue around the intersections of racism, misogyny and colonialism that are responsible for the precarious and dangerous position of Indigenous women in Canadian society. Exploring themes of memory, identity and resilience, Conversations with the Land (2016) activates elements of land art, performance and installation to attend to relationships between the land and the body. Mobilizing several modalities of creation, Conversations centers remembering and valuing cultural ties to the land. “In many ways, Conversations with the Land works in contrast to The REDress Project. I wanted to find the places where we are strong, to remember and honour the ties we have to the land. For me the land is where I remember my strength and find connection and healing” (Black, 2016). WGSI is excited to announce that we will be hosting Jaime Black for an artist residency from March 16th – March 22nd. The residency will feature both The REDress Project and Conversations with the Land. In addition, there will be a number of exciting and important events taking place. [PLEASE SEE BELOW FOR DETAILS]. This event has been co-convened by Dr. Karyn Recollet and Melissa Nesrallah (PhD Student, WGSI). Not only is this Jaime’s initial showing for the Toronto community, but this residency will mark the first time that these important pieces have been shown together as one fluid installation. An official poster/program will be released soon! So keep an eye out! You can also follow us on Facebook and Twitter- be sure to check back regularly. Note: Please RSVP to the events on our Facebook event page! What: Opening Gathering/Reception for Jaime Black’s Artist Residency: We Are The Land. What: Screening of Lisa Jackson’s VR Highway of Tears. To be followed by Jackson’s Shorts: Parkdale, Snare, The Visit, Pow.wow.wow, and Savage. Also features guest respondents Susan Blight and Jennifer Alicia Murrin. What: In the TV series “Mohawk Girls,” four twenty-something Mohawk women are trying to find their place in the world. And, of course, trying to find love. But in a small world where you or your friends have dated everyone on the rez, or the hot new guy turns out to be your cousin, it ain’t that simple. Torn between family pressure, tradition, obligation and the intoxicating freedom of the “outside world,” this fabulous foursome is on a mission to find happiness… and to find themselves. Join us for a free episode screening and Q & A session with Inuk actress Maika Harper. What: Jaime Black is a Métis multidisciplinary artist based in Winnipeg, Manitoba. Through the mediums of photography, sculpture, print, and installation she addresses the complexities of history, gender, place, identity, and resistance under settler colonialism. 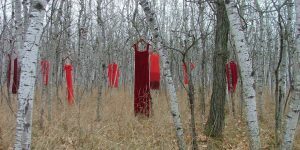 In this artist talk she will be discussing the installations The REDress Project and Conversations with the Land. Followed by Q & A session with the artist. Moderated by Andrea Derbecker. What: This panel offers a discussion of cultural productions meaningful to the exercise of decolonial futures. We explore forms of ‘urban glyphing’ as ways to speak about kinstilatory relations of Indigenous cultural producers and expressions of decolonial love. 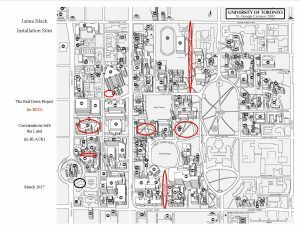 Invited artists and activists will share their rematriative processes of mapping decolonial love in our cities through their chosen artistic forms. What: Join us for a film screening of Migrant Dreams, a locally produced documentary that tells the untold story of migrant agricultural workers who are struggling under Canada’s Temporary Foreign Worker Program. Screening will be followed with a panel discussion to discuss the relationship between migration, labour, and Indigenous land. What: Guided walking tour of Jaime’s various activation site concluding at First Nations House, to experience Conversations with the Land. 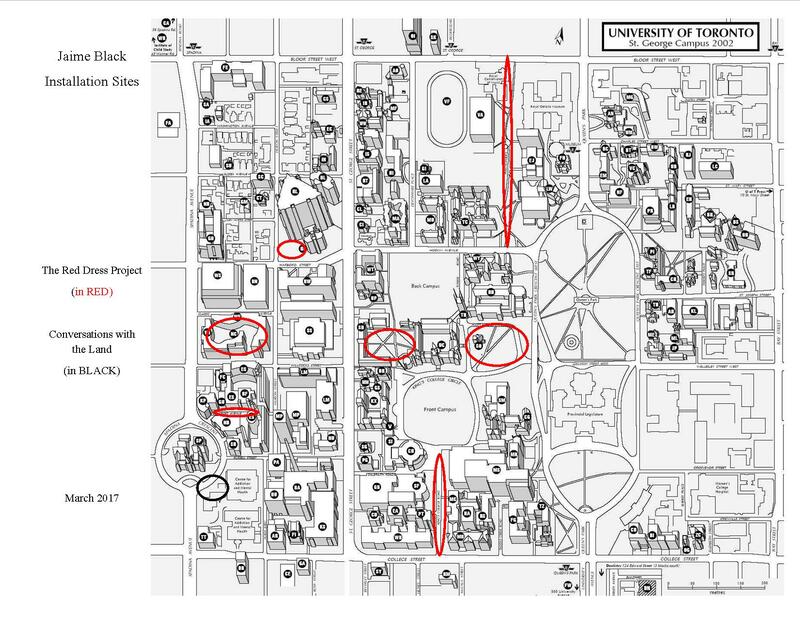 What: This workshop invites community members, activists, organizers, and those interested in the potentials of mapping- to turn our intentions towards the land and be generative about how we are in love with our futures. What does it mean, perhaps to map kinstillatory futures? Special Guests: Karyn Recollet, Jaime Black, Maika Harper, Nazbah Tom, and Jenny Blackbird. 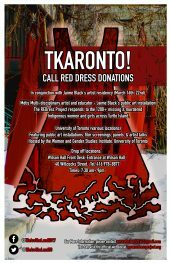 What: Jaime Black and the graduate students in Indigenous Decolonial Aesthetics WGSI 1025 will be showcasing a new piece of performance art. More details to come! What: Closing Gathering/Reception for Jaime Black’s Artist Residency: We Are The Land. Due to unforeseen circumstances, Jaime will not be at the closing gathering, however we will be playing video recordings of her messages. Note: All of the events are free and open to the public. There will be a designated children`s art table at each event. ASL services will be provided. All of the venues are accessible spaces. Some of the subject matter of We Are the Land could be triggering or difficult to process. If you’re feeling overwhelmed, here is a list of supports that you can access at the University of Toronto and wider community. Open every day from 8 a.m. to 10 p.m.